The startups founded by IIT alumni get mentoring, infrastructure support and funding at the Foundation for Innovation and Technology Transfer (FITT). 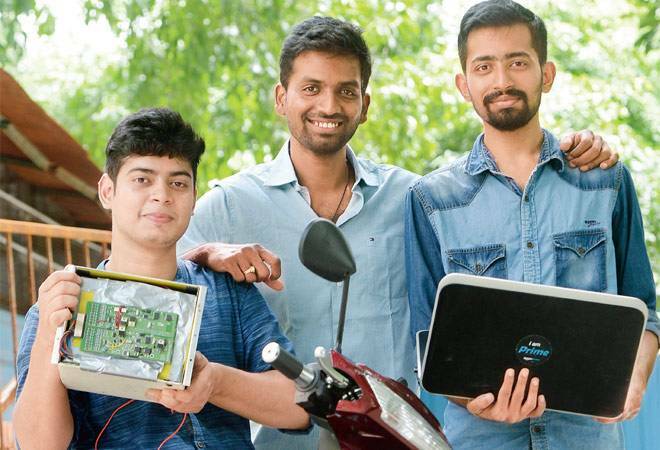 (L-R) Vecmocon's Nikesh Bisht, Adarshkumar B & Shivam Wankhede have designed AIbased battery for electric 2-wheeler maker Okinawa. Working out of 8 ft x10 ft rooms in IIT Delhi's incubation centre, as many as 18 infant technology startups are each striving to solve problems in fields ranging from automobiles to health, biotechnology and heritage conservation. The startups founded by IIT alumni get mentoring, infrastructure support and funding at the Foundation for Innovation and Technology Transfer (FITT). Opportunities abound in the government's push to electrify all vehicles by 2030, feel the founders of Vecmocon, a company that designs artificially intelligent electric vehicle components for original equipment manufacturers (OEMs). The year-old B2B company is run out of the incubator by IIT alumni Peeyush Asati, Nikesh Bisht and Shivam Wankhede and engineers Adarshkumar B and Prashanth Sridharan. "Even the big automobile names in India just import parts from China and fit them on to the vehicle's chassis. But we can design specific parts for them and they'll have access to technology," says Bisht. "For instance, electric twowheeler maker Okinawa is using 35-kilo batteries. For the same energy range, our design can be produced at 8.5 kilos," he explains. The startup has signed a contract with Okinawa. The founders believe the hardware they are working on is just the tool to collect data. "The bigger thing is the data associated with the automobiles. It can be used for predictive maintenance, by traffic agencies, and by OEMs to improve products," says Wankhede. The company expects 1,000 electric scooters with their technology to be on the road by 2018-end. Vecmocon, which has filed two patents, has started vehicle testing. The incubation centre allows companies to stay on for two to three years. During the remaining two years at FITT, Vecmocon wants to cover 10,000 vehicles. As India rakes in the dubious distinction of being among the most polluted countries every year, IIT-D alumni Prateek Sharma, Tushar Vyas and Jatin Kewlani of Nano Clean Global have developed naso filters- nano technology-based nasal filters that filters the air that the wearer inhales. "While such filters are available abroad for pollen allergies, our product's USP is in the design and its capacity to filter out 95 per cent of 2.5 PM, the most dangerous among pollutants," says Vyas. With help from professors and founders Ashwini K. Agrawal and Manjeet Jassal of the textile technology department, the company has developed a prototype and is set to launch the product in Delhi-NCR by Diwali at Rs 10 a pair. A face mask of similar efficiency costs Rs 2,000, Vyas adds. "After the launch, we plan to leave the incubator to scale up our business," Vyas adds. Nano Clean Global has been at the incubator since February. "IIT has all testing facilities which are otherwise expensive for tech startups. Private incubators don't have them, though they excel in marketing support," he adds. Anupama Malik, Geetika Sharma and Vijay Chandru's nearly year-old startup wants to use forward-looking technology to preserve the country's centuriesold heritage. Vizara was born out of a government project to digitise the UNESCO world heritage site of Karnataka's Hampi. The startup of Malik and Sharma, PhD alumni from IIT-D, scaled up two parts of the project. 'Virtual Vittala' is a scaleddown physical replica of a temple in Hampi which guides the user through a virtual walkthrough of the model using a laser beam. The second project, ontologybased story narrations, is at the demo stage. "We have pitched our idea to the government. The ministry of culture and even the external affairs ministry can use our models in their embassies to show tourists who come to get visas," she adds. Malik says FITT gives them a brand name, which matters especially when you pitch to the government. "Plus, the infrastructure is great. We can use the 3D printer for our models. There is exchange of tech expertise among various startup founders." Vizara has been here since October and applied for a seed fund of about a crore.